So I was in Target last night picking up one of those Digital Converter boxes for my mom and hunting for the new purple peep (Sonia Kashuk blending sponge), which I didn't find. 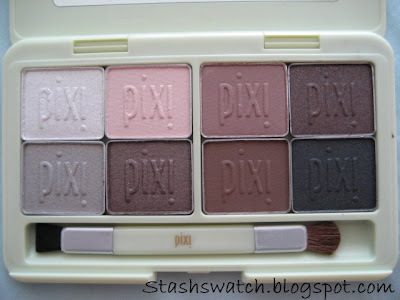 Determined to pick up SOMETHING, I wandered over to the Pixi display, where I picked up one of the eye palettes in Mod (retail $28), which appeared to be a nice palette of neutrals, and brought it home with me. The product is encased in ugly green plastic (which I could forgive) and is fairly thin. There is a small mirror inside, and a rather useless looking double ended brush. 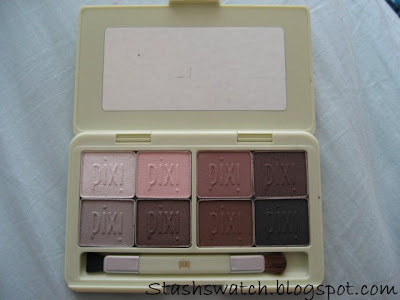 My biggest pet peeve about this palette is that the pans are not glued in very well. The glue reminds me a bit of rubber cement, except that it stays much softer than rubber cement does, and the pans tend to wiggle a bit. The pans are easily pried out with a toothpick..so if you decide you hate the green plastic, you can easily depot them and put them into something else. Luckily, the colors inside are quite pretty and the quality seems decent. All 8 colors are soft and blendable. 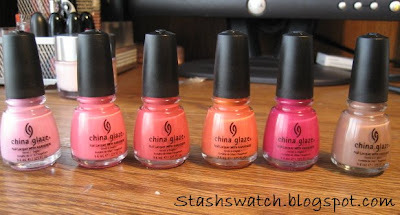 They are all pretty sheer, but quite easily built up on the lid. Edit: the color fades off after a couple of hours for me. closeup of the eyeshadows inside. Here's another pic under lamp light to show off the finish of these shadows. The lighting is warm here. 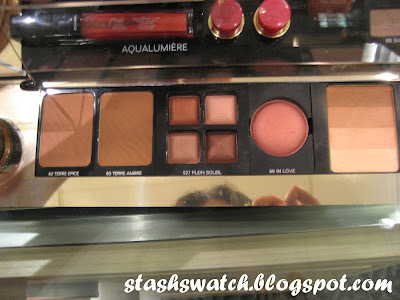 Overall the palette is mediocre, and I probably would not buy this again. The colors are nice and the quality seems decent enough, but it leaves me with a feeling of "that wasn't worth it" If they dropped the price of this by $10 or so though..that'd be a different story. For what I paid for this, I expected better pigmentation and packaging that was less shoddy. Either way, it was worth a try. 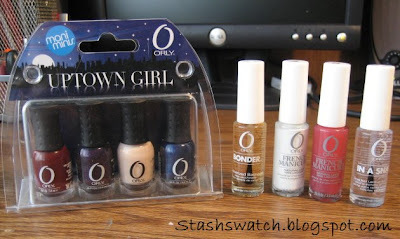 As I'm allergic to fragrance and didn't want to spend $80 on skincare, I opted to buy this set off eBay. It was even more beautiful in person than it was in product photos. The set included a palette with 15 eyeshadows (all in their permanent line, a smaller palette with 2 blushes and a bronzer (also permanent), 3 lipsticks (permanent), 2 lipglosses, 3 brushes, an eyeliner, a mascara, and two cosmetics cases. The brushes were complete cr@p and I'm not really going to use the mascara or the eyeliner, but the rest of the set is quite nice. The brushes in this set, while kind of pretty with their gold handles, are terrible. They're quite scratchy, and aren't what I'd use for applying my makeup. They went straight into the trash for me. (If you have a pet that likes eating brushes..these are good for that) The eyeliner is a regular black pencil liner that tugged a bit, but stayed in place all day with no smudging or fading. I'm not a big fan of pencil eyeliners so it's unlikely that I'll use this again, but I kept this just in case I ever needed to draw a divider on my arm. The Gentle Eye Makeup remover is pretty decent, and is a great oil free makeup remover. It's not the best for removing waterproof makeup, but very few oil free makeup removers are good for this. 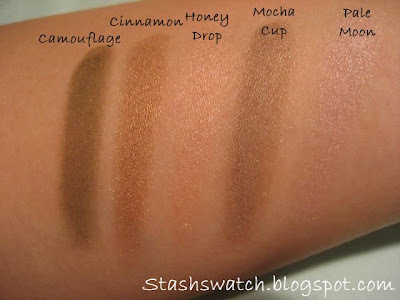 This is definitely one of the better ones I've tried though, and is currently what I use to take makeup off my arm between swatches. (which feels like a waste to me, but can't use any makeup removers with oil for this) I didn't bother trying the mascara since non waterproof mascaras don't hold curl for me. Here's the set inside the larger case. It's a suitcase style hard case without sections. I like it, but it's pretty useless for travel in my opinion, because things will just clatter around and most likely break inside..still, it's nice. 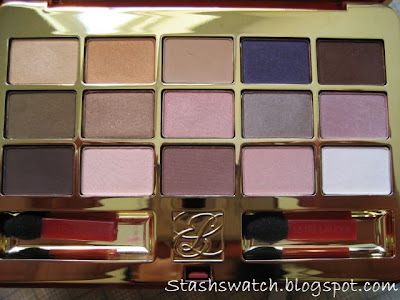 There are 15 eyeshadows encased in a red plastic case, with per row. 13 are regular singles, while two are from one of the regular duos (Roseberry). 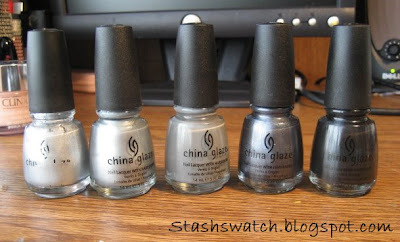 The shadows are all smooth and buttery, but kind of sheer. 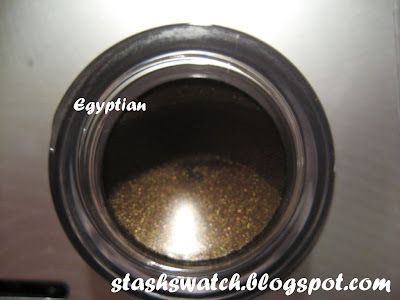 Bronze Cube: this is close to matte, but has very very tiny bronze shimmer. It's not quite satiny either. 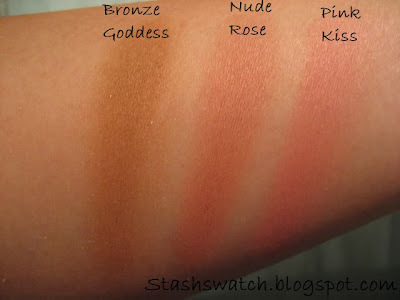 Here's the blush palette.The bronzer is Bronze Goddess. 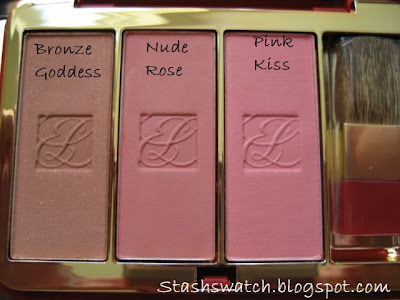 This seems to be a favorite of Estee Lauder's for GWPs. 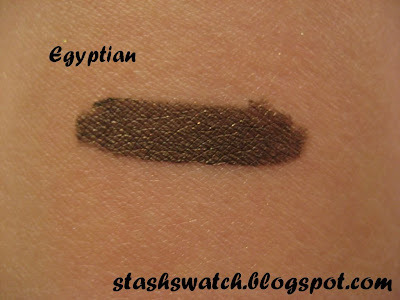 This appears to be a warm brown with copper shimmer dispersed throughout he bronzer. On my arm though it appears to be matte. 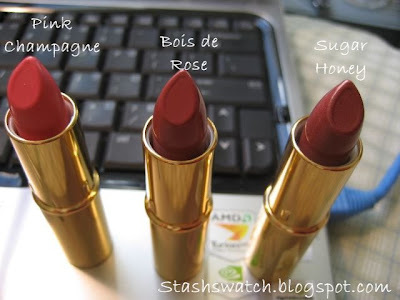 The three lippies that came with this set were encased in gold tubes and are full sized products. They have the standard Estee lauder scent to them. 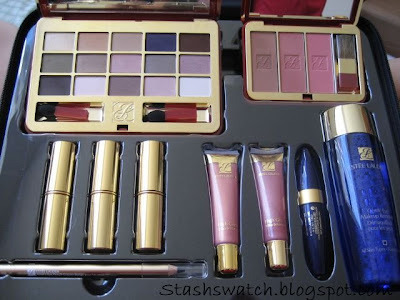 This set also came with two of Estee Lauder's high glosses. 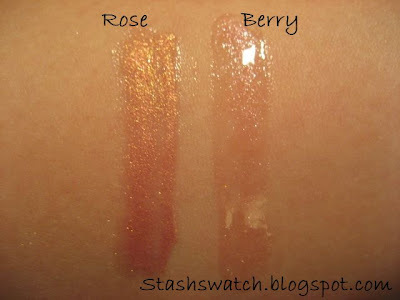 (Rose and Berry). 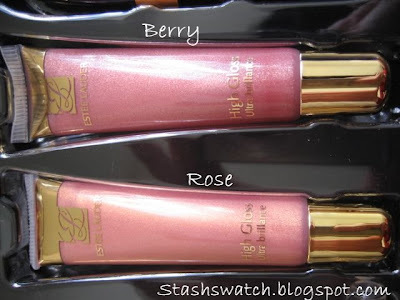 These glosses are scented, but it's a bit difficult for me to place what they smell like (they've got an odd perfumey taste to them too). They're not completely nonsticky, but they're still nice. These glosses, while absolutely gorgeous in the tube are rather sheer on, which I suppose makes them good for topping lipsticks. Rose is a light pink shade with gold shimmer. This is the more opaque of the two. I hope you've enjoyed this post. Please let me know if the new font is difficult to read as a label. As a bonus, and to show just how long I've been putting off labeling and posting these swatches...here's my cat. From her size there, I'd say she was 4 or 5 months old..so I've been putting this off for at least a month. 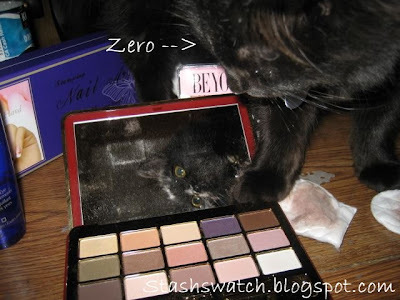 She takes great interest in my swatching activities..I didn't even notice her paw was on the mirror of this palette until after I saw the picture..but as she's never actually TOUCHED the makeup itself, I suppose it's fine. I also have to apologize for any typos in this post and future posts..my laptop's keyboard is a bit on the fritz and doesn't always register my input. So it took me a while, but I finally figured out how to add an email subscription box..so there it is..to the right of here. 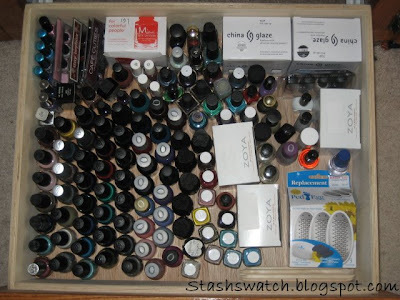 Today I have pictures of my nail polish stash for you. 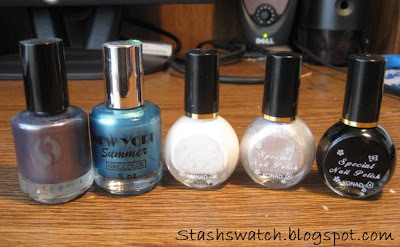 I didn't label them, but if you want them labeled, or just have a question about what a specific polish is, I'd be happy to answer your question. Also, the font I used to label my pictures has changed. 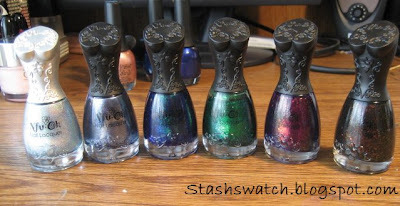 If you find this is hard to read, please let me know (I guess it doesn't matter for this post though) The polishes are, for the mst part, sorted by brand and color. 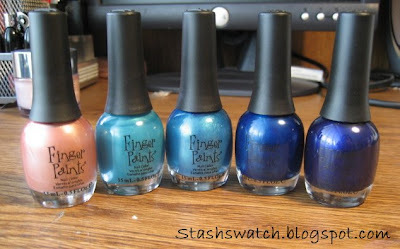 Nfu Oh polishes..these are Korean polishes I got off FabulouStreet.com for $12.50. They're only about $7 in Korea though, so if you have a friend who's in Korea or going to Korea..ask them to get these for you..they're very unique and pretty. MAC and CHANEL. 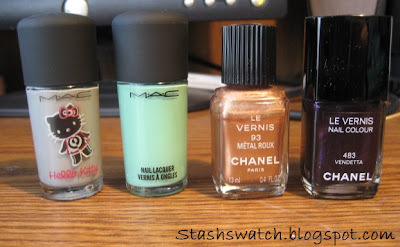 I'm not a huge fan of MAC polishes, but I liked these colors. Anyways, here are a few things that are coming up...let me know what order you want these in! 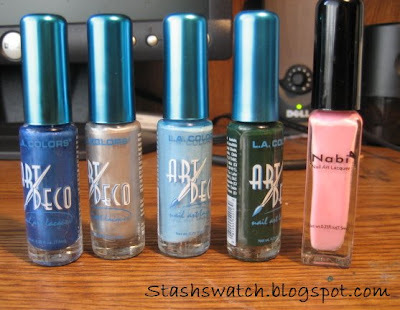 The second part of my mall swatching experience involved heading into Sephora. The SAs there told me I wasn't allowed to take pictures inside the store, so no product photos. 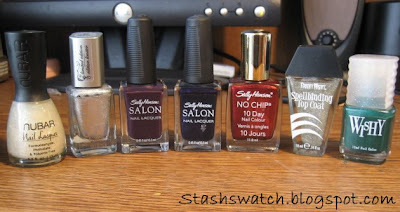 (I'm not sure what the problem is really..it's not like I'm stealing) Either way, I decided to just swatch these today since there were 2 SAs hovering over me while I was in the store, which made me a little uncomfortable. They didn't ask me if I needed help, just kind of sneered at me. 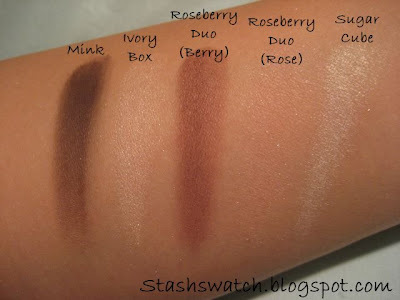 As such, I'll probably keep swatching trips to Sephora down to a minimum (though the SAs at this Sephora have always been particularly snarky) I will probably be eventually swatching Josie Maran stuff since it's not readily available in a lot of places (luckily I own about 1/2 the perm colors of e/s already so I can do that at home.) 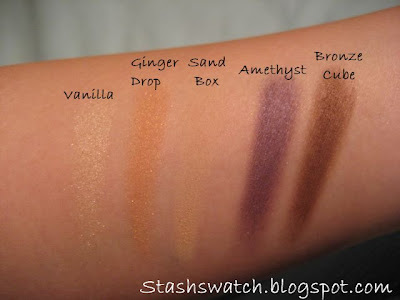 Anyways...here's the 3 limited edition cream shadows Benefit put out this year, applied kind of heavily for swatching, though it didn't come out quite as pigmented as it was rl. Sippin' n dippin' is a peach and gold duochrome. It looks a bit odd in the pot, but it's kind of pretty on. 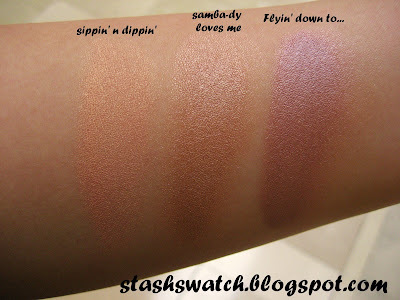 Samba-dy loves me is kind of a weird color to describe for me, maybe a milkyish slightly warm brown?, it mostly just boils down to a nice satiny slightly warm neutral shade. Flyin' down to fits it's description..it's a soft orchid color. The picture was taken in cool lighting and then color adjusted a bit so the temperature of the picture may be a bit off. 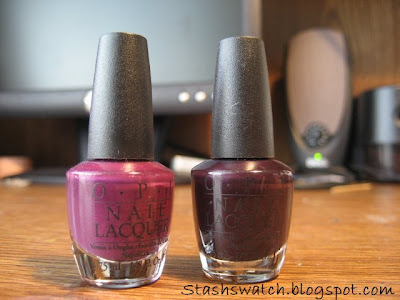 So what I DID swatch was the quad, the two singles, and In Love. The texture on the testers for the quad and the JC had very odd textures when I were swatching them; they had this weird rubbery sort of texture that I had trouble pulling color off of. I'm not really sure what the deal on those was. 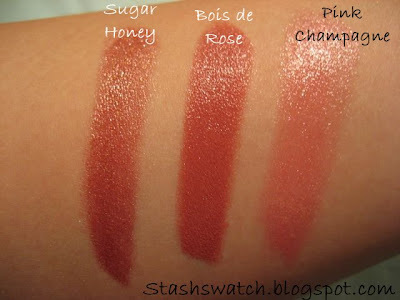 The quad, Plein Soleil, retails for $56 and is a quad of pink an pink bronzes. It seems like a quad that's difficult for a lot of people to wear. 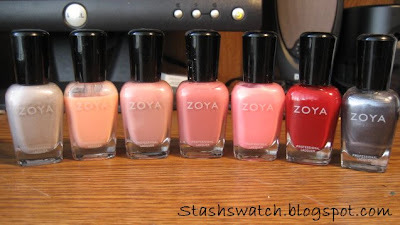 The soft touch singles, Island and Sand, had the regular soft, buttery texture. 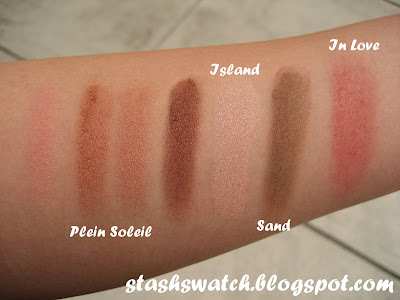 Island was a shimmery pink champagne color and Sand was a taupey matte tan. Both were very nice, but passable imo as they both seem very dupeable. 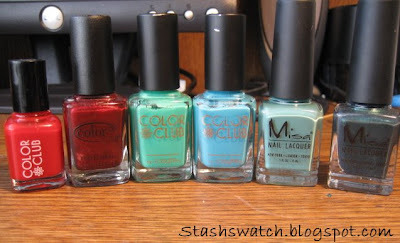 The JC, In love was a somewhat reddish coral to me. 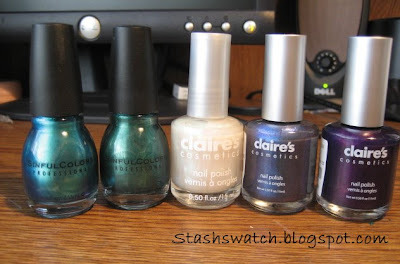 The shimmer didn't really show up on me, but it could have been the strange texture of the tester. 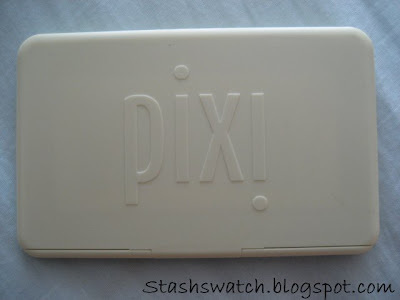 (I actually think there was something wrong with it) Either way, my impressions of this blush was that it was very similar to the coral blush in the Stila Blanc palette, but again...I find that it's a bit hard to tell given the wonky tester. 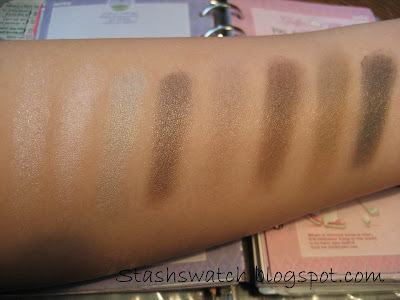 Here's a closeup of the LE stripey bronzer. 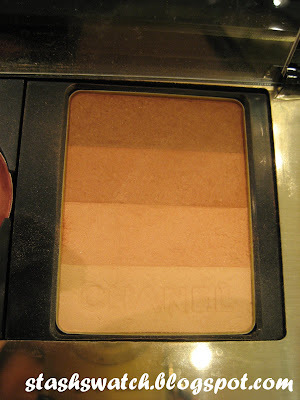 I'm not sure what the name of this is, and I didn't swatch this because it was kind of light on my skin (it showed up, but it was an overcast day, I didn't know if it would photograph) It seemed like it'd be nice for light skintones, but it leans a bit orangey for me. 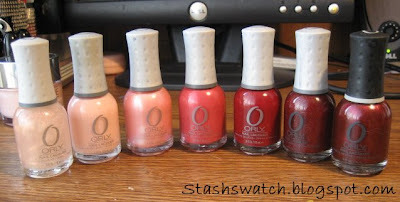 That's it for this little update I guess...should I go back and swatch the rest? First off, thanks so much to those of you who read my blog. It's a great feeling to log on and see comments on my blog posts. (I really have no idea anyone's reading otherwise) I've been distracted by a new obsession lately (nail polish) and have completely wrecked my sleep schedule (evident from the fact that I'm posting at 5:19 AM I suppose) so I haven't really been swatching anything. Lucky for me I have a bunch of "back swatches" so today I'll be posting about Clinique's awesome cream liners. 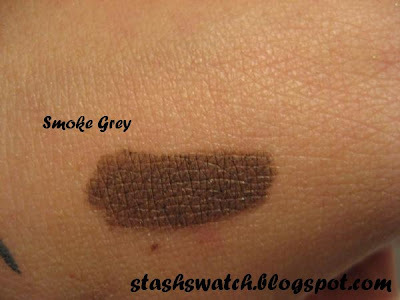 Smoke Grey is kinda a beautiful grey taupe in the pot, but most of the taupeyness just dissapears on me once on the skin. 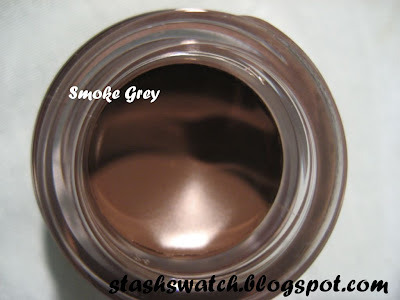 Nevertheless, it's still a beautiful, unique smokey grey that makes me love it so. 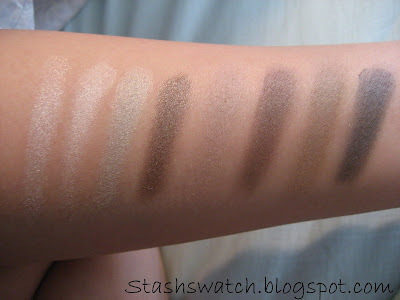 I'm not really sure why I decided to swatch this on the back of my hand though...it's kind of a bad swatching place? The second one I own is the much lusted after Egyptian. This liner is gorgeous and a must have for me as it is a very unique and complex color. It's a blackened bronze, possibly with a hint of grey taupe that is just all around gorgeous and I can't live without. I have a backup of this baby and I kind of wish gel liners had a longer shelf life so I could have gotten more. Either way, it's gorgeous and you should get this if you can. I was lucky enough to score this for cheap from CCO. So long, poorly written post short, go buy yourself some Clinique cream liners. They are probably my favorite gel liners I've tried and are worth the money if you want to try a gel liner.